The Ideapad series has come a long way since the previous generation and the Ideapad 320 is here to prove it. Even though it’s the entry-level model, the Ideapad 320 still has a lot to offer for despite its low price. The update over the Ideapad 310 is significant but is it enough to convince us into buying this instead of the slightly pricier Ideapad 320s, which is equipped better. Okay, what’s new in the updated version? The Ideapad 320 features a brand new design, a wide choice of color options, obviously new hardware going up to Intel’s Kaby Lake Core i7 family, although the latter will bring up the price quite a bit. 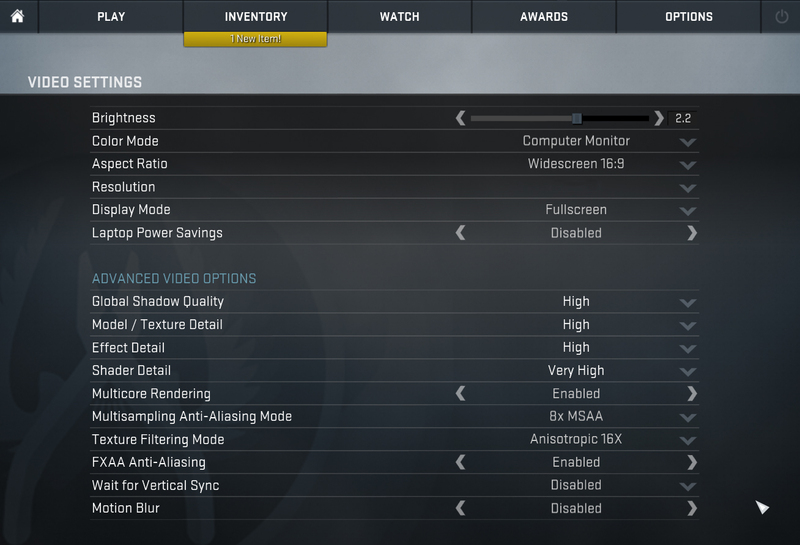 Also, the touchpad and the keyboard receive a major overhaul and the display has been changed. 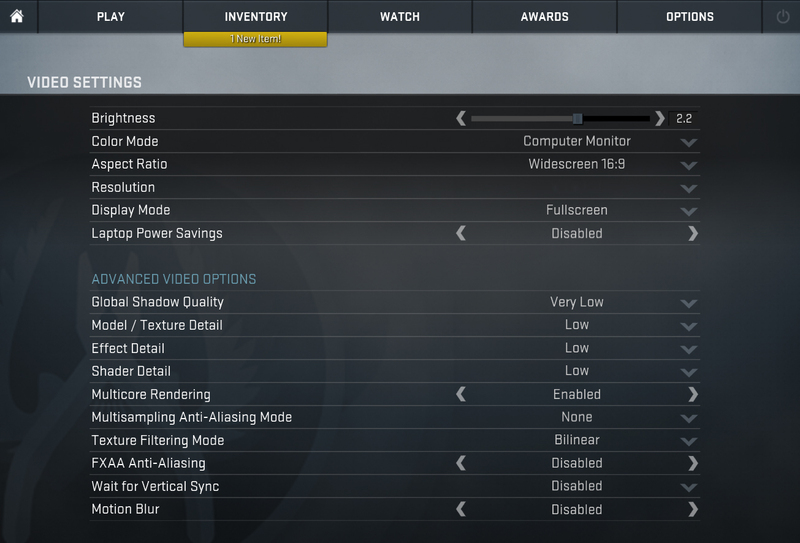 Unfortunately, though, no IPS options this time around either. We just hope the price difference between the Ideapad 320 and 520 is bigger now because last year, we thought the Ideapad 510 is a much better choice than the Ideapad 310 in every possible way even considering the price. We will see if this still stands true this time around. The laptop came in a standard box containing all the usual user manuals along with the AC adapter and power cord – nothing out of the ordinary. 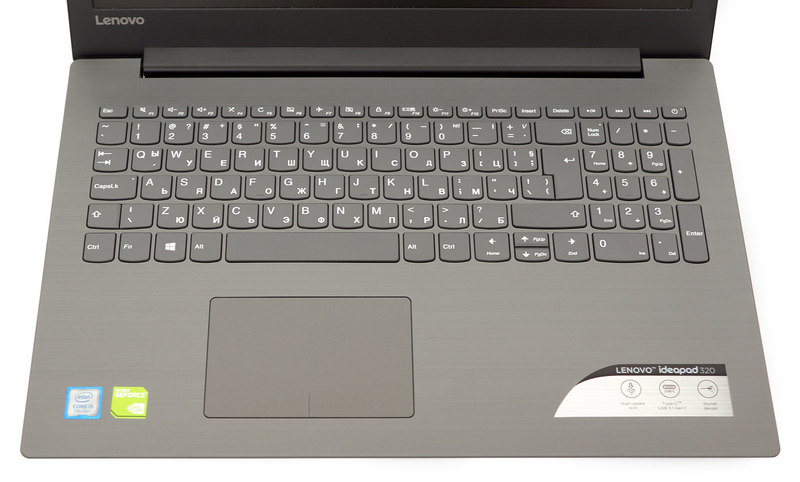 The chassis of the Ideapad 320 is largely the same as the one of the Ideapad 520 but with a few key differences. 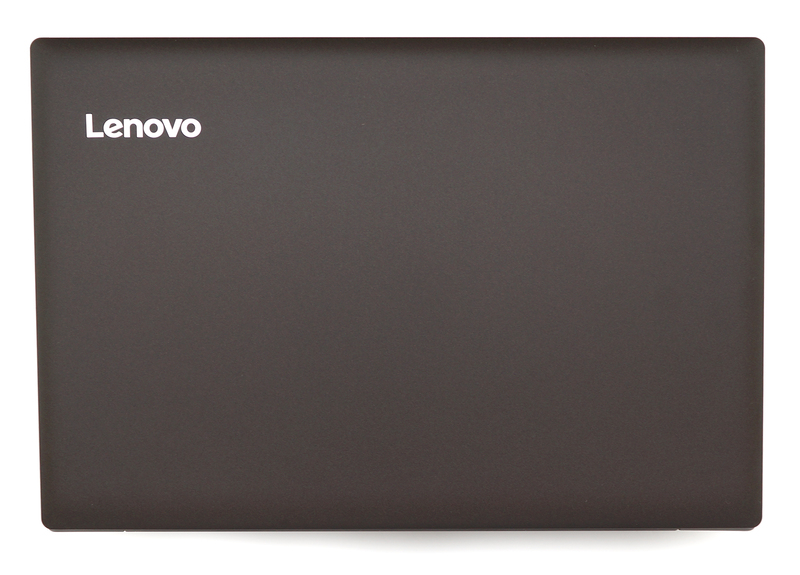 For instance, the Ideapad 320 relies mostly on plastic while the Ideapad 520 uses aluminum for the lid. It’s needless to say that this was expected due to the significantly lower price tag of the Ideapad 320. We are happy to report that the weight of the machine has gone down by around 200 grams as of now, the machine weighs a little over 2 kg but the thickness is still the same – 23 mm. Let’s start with the lid. It’s made of plastic with smooth finish and doesn’t attract fingerprints and smudges. The material, unfortunately, isn’t very resistant to force and torsion – the deformation is visible and ripples appear on the LCD screen when pressed in the center. Moreover, the hinge doesn’t hold the lid very firmly on an unstable surface and you can feel a slight creaking when opening up the laptop. However, it’s not as tightly pulled as we expected because opening up the lid with one hand is possible. 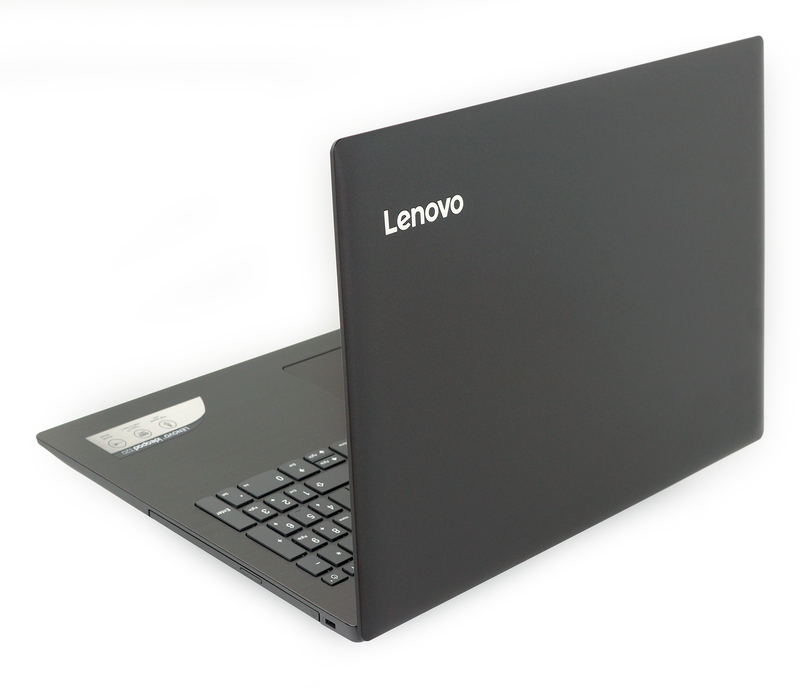 All of this is usually expected for an ultra-budget laptop but we think that Lenovo could have done a slightly better job here. The bottom piece, at least, is very stable, rigid and provides a few vent openings for extra airflow. 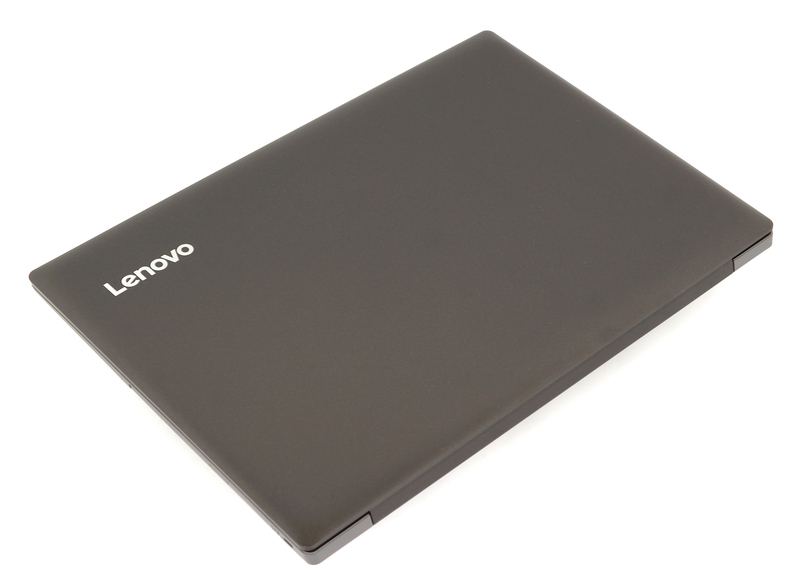 The sides are almost identical to the ones of the Ideapad 520. There are no connectors on the right – only the optical drive – while the left side accommodates all of the ports. 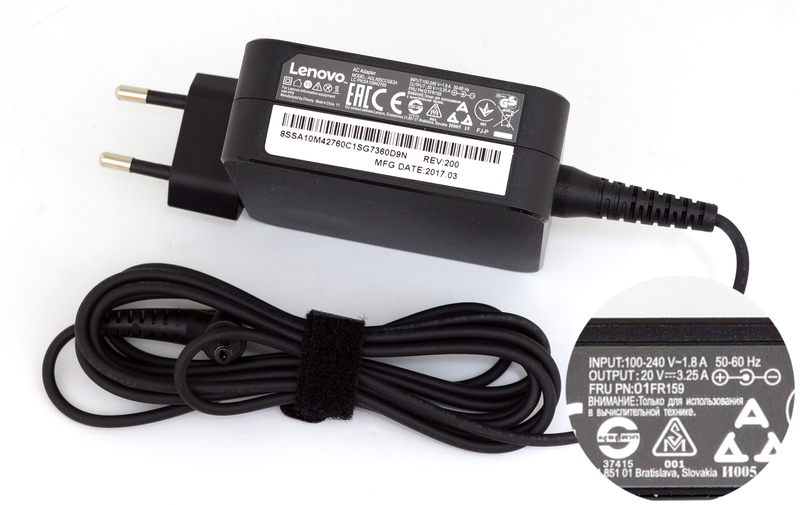 We’ve got the RJ-45 LAN port, HDMI, two USB 2.0, a 3.5 mm audio jack and the SD card reader. It’s funny, though, that the unit we got has only two full-sized USBs and none of them is a 3.0. We really hope that the final units will have at least one high-speed USB connector. 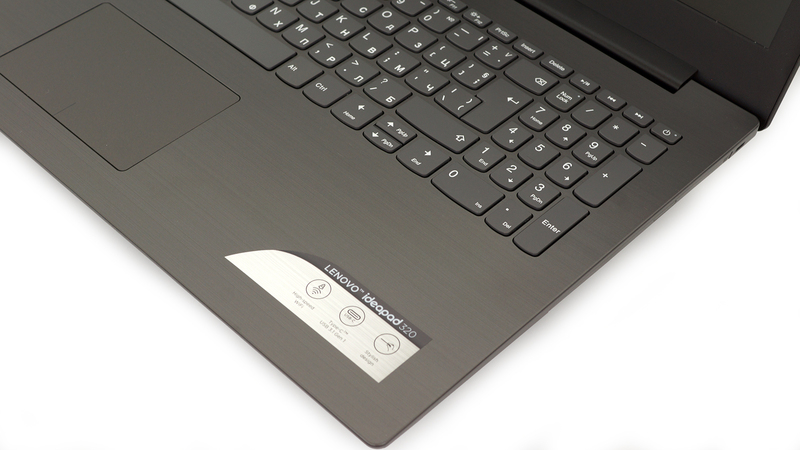 When you open the laptop, you will immediately notice the smooth and pleasant to touch surface of the interior, which is still plastic, though. It feels nice but it’s not as rigid as we would like. Pressing almost every spot around the keyboard and the wrist rest area results in bending and you can hear the base creaking at times. Again, considering the price point of the product these inconsistencies are expected but we still expected a bit more. The keyboard, on the other hand, is nice. There’s no LED backlight but has good tactile feedback, clicky feel and decent travel distance. It’s surely one of the best we’ve tried at this price range. 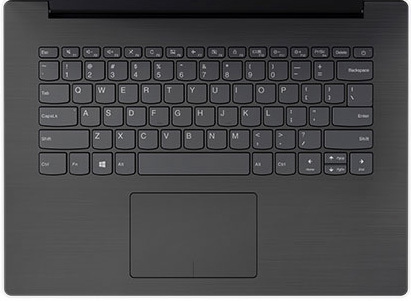 And as for the touchpad, at first it’s really similar to the one of the Ideapad 520 but the surface is a bit wobbly and precision is missing at times. It’s still decent enough to get the work done while on the go. To be honest, we liked the previous design with the dedicated mouse buttons better since it avoids the possibility of a wobbly surface. The Ideapad 320 definitely has an identity with cool looking new color themes and an excellent keyboard. However, even for this affordable price tag, we would have appreciated a better choice of materials or at least a more stable base. 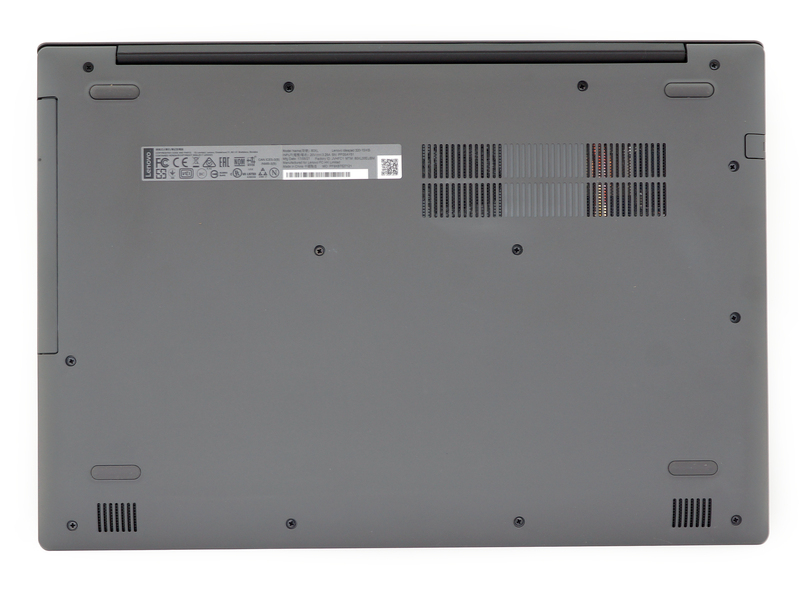 We didn’t have the chance to snap some photos of the internals but since the chassis is almost identical to the Ideapad 520’s along with the inner construction, you can easily use the guide from Ideapad 520 for disassembly, upgrade and maintenance. Keep in mind, though, that there’s a significant difference between the two – the Ideapad 320 lacks an M.2 SSD slot but you can find it in the Ideapad 520. 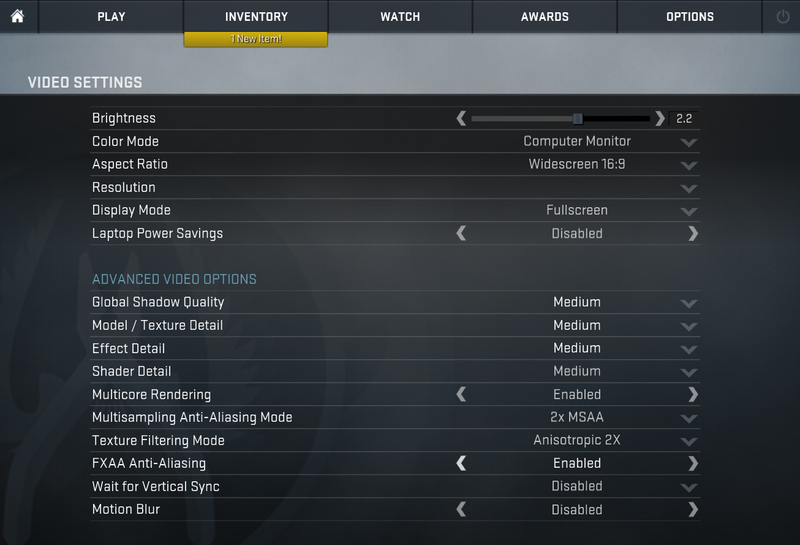 The configuration we’ve tested featured a familiar Full HD (1920×1080) TN panel from BOE with model number NT156FHM-N41. 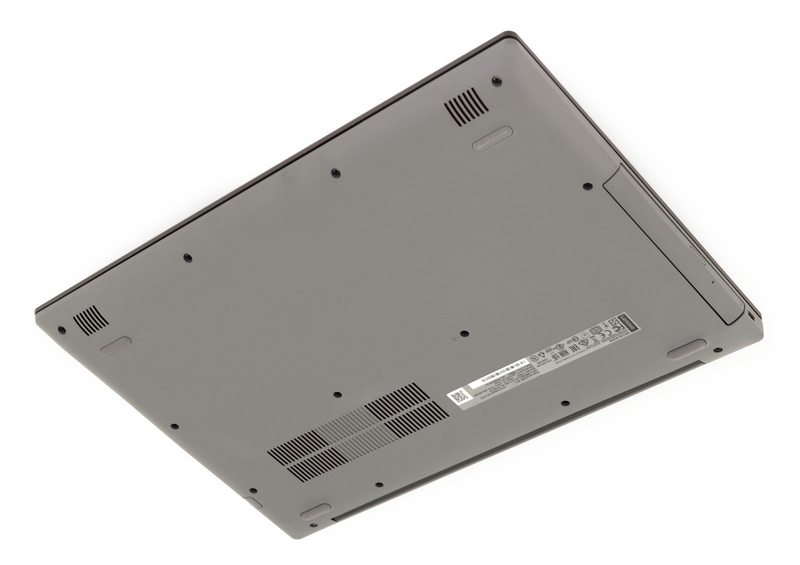 This particular panel was used in the very first Acer Aspire VX 15 units that shipped with TN displays. So we still get 142 ppi and 0.18 x 0.18 mm pixel pitch. It can be considered as “Retina” at least from 60 cm. As to be expected from a TN panel, viewing angles are limited. We’ve recorded a peak brightness of just 189 cd/m2 in the center of the screen and 184 cd/m2 as average across the surface with 7% maximum deviation. The correlated color temperature at maximum brightness is just a tad colder than it should be – 6740K and shoots up to 11000K when you go along the grayscale. You can see how these values change at 140 cd/m2 (92% brightness) in the image below. The maximum color deviation dE2000 compared to the center of the screen should be no more than 4.0 and if you are planning to do color-sensitive work, it should be lower than 2.0. And in this case, since the laptop is going to be used mostly for office work and general browsing, a deviation of 1.4 in the lower left corner is an excellent result. 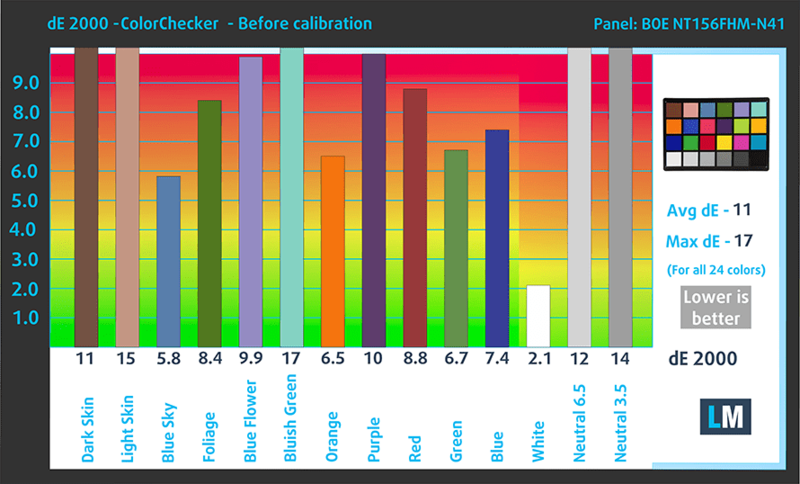 The contrast ratio is extremely low – 317:1 before calibration and 300:1 after calibration. The display covers merely 49% of the sRGB color gamut, which means that less than half of the colors used on the web won’t be reproduced. Unfortunately, the display uses PWM for regulating screen brightness from 0 to 99% and pulsates at relatively low frequency (6.8 kHz). Users with sensitive eyes will surely feel the effects of the screen flickering. 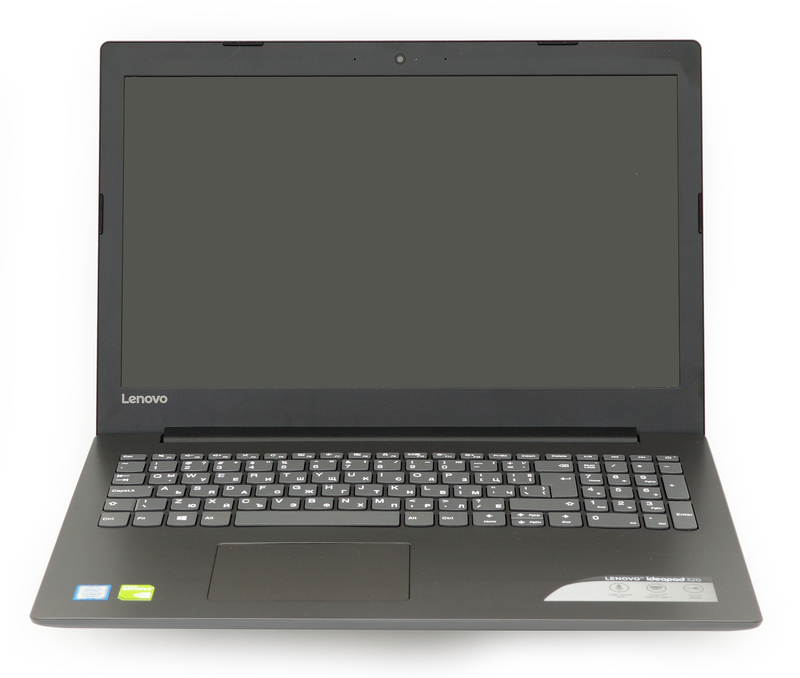 A notebook priced under $500 is bound to have some considerable drawbacks and in most cases, the screen suffers the most. We can’t say the display quality is good but this is the industry’s standard. Rarely can you find a notebook with an IPS screen in the same ballpark. Still, you will need to consider the facts – low maximum brightness, limited sRGB coverage, extremely low contrast ratio and uses PWM for regulating screen brightness from 0 to 99%. The latter can be fixed by our Health-Guard profile while the Design and Gaming profile will fix some of the issues related to color inaccuracy and color temperature. The sound quality is decent but there’s a small distortion in the low-frequency range. We can overlook the poor battery life on the entry-level configurations but as the price and the hardware get higher, the 30Wh just doesn’t do justice to the notebook. Even the TN panel and the energy-efficient Core i5-7200U are not enough when the battery capacity is insufficient and as a result, the Ideapad 320 offers subpar endurance. All tests were performed with the usual settings – Wi-Fi turned on, screen brightness set to 120 cd/m2 and Windows battery saving feature turned on. Here you can see an approximate comparison between the CPUs that can be found in the Lenovo ideapad 320 (15") models on the market. This way you can decide for yourself which Lenovo ideapad 320 (15") model is the best bang for your buck. Here you can see an approximate comparison between the GPUs that can be found in the Lenovo ideapad 320 (15") models on the market. This way you can decide for yourself which Lenovo ideapad 320 (15") model is the best bang for your buck. The CPU and GPU torture tests are used to assess the overall stability and effectiveness of the cooling system in the long run rather than represent real-life usage. This gives us a good estimate on how the system utilizes the hardware. 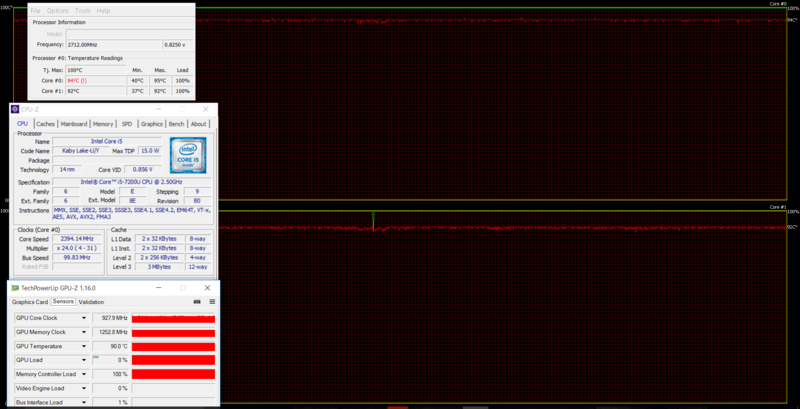 As we’ve already expected given the CPU benchmark results, the laptop’s Core i5-7200U wasn’t able to reach its maximum potential and ran at its base frequency of 2.5 GHz during the one hour long CPU stress test. And it wasn’t running very cool either – around 70 °C. 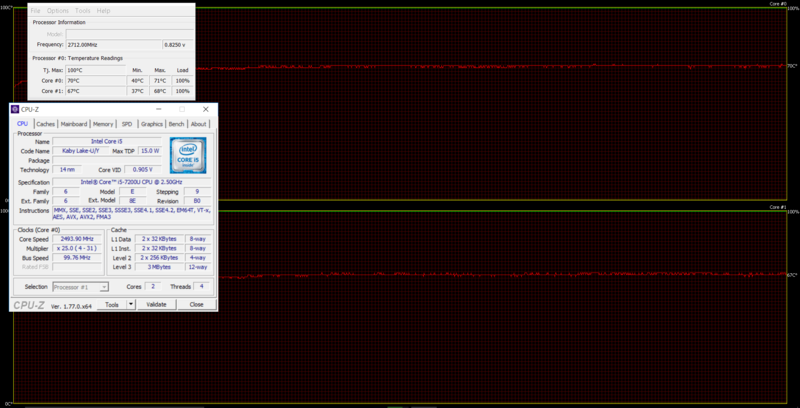 Turning on the GPU stress test didn’t result in lowered CPU performance but the former didn’t reach its maximum frequency and floated around 900 MHz. Moreover, both chips got extremely hot, especially the GeForce 940MX – around 90 °C. We haven’t even seen gaming notebooks with considerably more powerful GPUs reach such high temperatures. And due to the positioning of the chips and the heat pipes, you can feel the heat coming from inside near the left side and center of the keyboard as well as around the touchpad. That’s, of course, during heavy workload but since the CPU and GPU aren’t that powerful, such high temperatures don’t look good on the Ideapad 320. While the price can be used to justify most of the notebook’s drawbacks, there are some apparent issues that still need to be addressed in the next version. Yes, sure, the Ideapad 320 is a big improvement over the previous version but there’s still a long way to go. 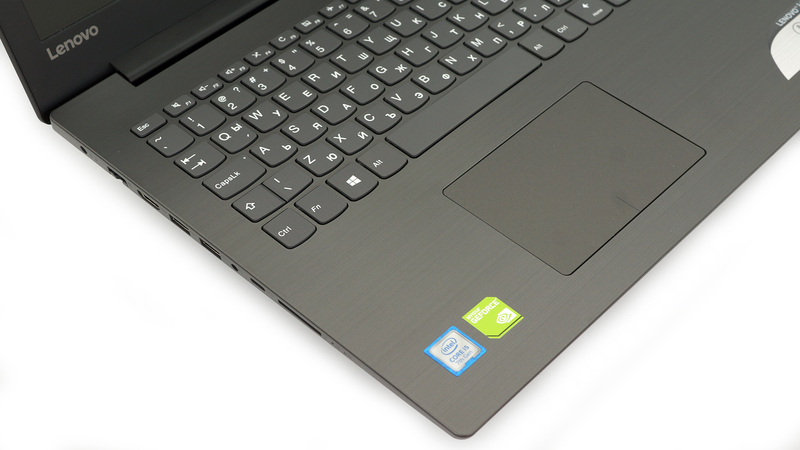 The build quality issues and utterly bad display quality can be overlooked in the absolute entry-level configurations but if you are planning on purchasing the configurations with Intel Core i5, i7 and discrete graphics, you should seriously consider spending just a tad more for the Ideapad 520 or for the Acer Aspire 5. Most of the Ideapad 520 and Aspire 5 configurations feature IPS panels (the latter’s is excellent) and offer considerably better build quality and input devices. But even if you can get past the low maximum brightness, narrow sRGB coverage and extremely low contrast ratio, be aware of the PWM that the screen uses for regulating brightness. It can be avoided by using our Health-Guard profile. In addition, the battery life isn’t impressive by any means due to the rather small 30Wh battery while so even the TN panel can’t save enough power. The most interesting thing about this laptop, however, is its cooling capabilities. Even the undemanding Core i5-7200U and NVIDIA GeForce 940MX run really hot during heavy workload while the heat disperses across the whole interior, yet can’t utilize the full performance of the CPU as you can see from the benchmarks and stress test. Of course, this won’t happen during normal use but it is still a sign of poor cooling design.